WE HAVE an active week, leading up to an activated New Moon next Sunday. To use this week wisely, we will be getting clear on our intentions, as well as breaking free from and releasing fears that have stood in the way of our achieving those intentions. To help us in that regard, the asteroid Juno aligns with Uranus on Tuesday and squares Pluto on Thursday. These interactions bring forward the possibility for change in our significant relationships, and a shift in how we perceive our need for partnership. SPECIFICALLY, the alignment between Juno and Uranus in Aries may provide the courage (or heightened anger) needed to break free from some of the less evolved manifestations of relationship. This may mean facing and overcoming the fears of abandonment, betrayal, and loss of self. It may also mean opportunities to see where and how we have given away our power to others, used manipulation instead of directly addressing issues, and/or repressed our needs or projected them onto the other person. When Juno and Uranus align, the need for freedom and independence within the context of close relationships is highlighted. Once we move into the more highly evolved version of our relationships, we can use this alignment to envision new, creative ways for each partner to more fully express their individuality, while also maintaining a healthy level of connection. This is the time for change and innovation with respect to our most important committed relationships. THE SQUARE two days later between Juno and Pluto complicates issues, however. The opportunity and imperative for change continues — but now it must face the challenge of redefining the relationship based on coming to terms with the unspoken (and sometimes hidden) motives of each partner. If the outcome of acknowledging and allowing each person’s individuality activates power struggles, it’s probably an indication that the unconscious agreement for one partner to dominate has been challenged. The one who has been less dominant may find resentments arising, coming from a place of “when is it going to be MY turn?” The one who has been more dominant may find jealousies or other control patterns coming to the surface, triggered by the fear of having their significant other be more independent and equal. COMMUNICATION is another theme for the week, appropriately. As Mercury and Mars interact on Monday, some angers and frustrations that have been brewing may come to the surface. By Wednesday, when Jupiter trines Mercury, the urge to fully explain our feelings will be very strong. THE RELATIONSHIP THEME continues into the weekend. On Saturday, Mars trines Venus to enhance the harmonious dance between the masculine and feminine — but at the same time, Saturn squares Venus, which indicates there are still some challenges to be addressed. Saturn is currently retrograde in Scorpio, so we are in a review phase of looking at our deeper motivations and psychological needs. Even if we bemoan the idea of yet another planetary challenge, this one comes at an important time, helping us see the truth of our situation and providing some objectivity that may otherwise be lacking. THE NEW MOON on Sunday is our annual Aries New Moon. 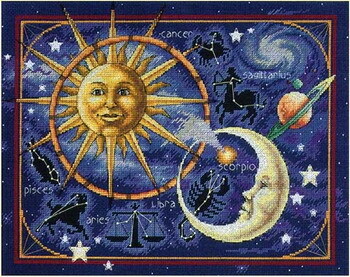 This marks the beginning of the first lunar cycle of the new astrological year that began on the Equinox. I began today’s journal calling this an “activated” New Moon — not only because it is in a very active and energized sign, but because the Sun and Moon are conjunct Uranus, square Jupiter, and square Pluto at the time of the lunation. In other words, although Mars is still out of range, this New Moon activates the other three planets in the Cardinal Grand Cross that we’ve been talking about since the beginning of January. We can call this a fairly important energy wave building up to the main event in mid-April. THIS LUNAR CYCLE that begins next Sunday literally sets the stage for the profound changes and transformations represented by the grand cross. This is an opportunity for us to get on our surfboard and set our intentions for where we want the wave to take us. This is another reason it’s a great idea to use this week to get rid of some of the excess baggage we’ve been carrying with us. It’s hard enough to maintain balance on a surfboard — imagine if we’re also trying to juggle two suitcases and a carry-on at the same time. Beginnings always require endings, and endings always precede new beginnings. For all of us, this is one of those pivotal times of life when the transition between the old ways and the new ways both excites and challenges us to be more than we have been before. NorthPoint Astrology Blog: To read recent blog posts, please visit http://northpointastrology.blogspot.com/. NextThe Astrology of April 2014 – New Paradigm?